Glenn Neigenfind invited me along for some adventures on Thursday afternoon and evening. I mentioned that my mom likes wildflower pictures, so we stopped frequently to get photos. Here are the better ones. 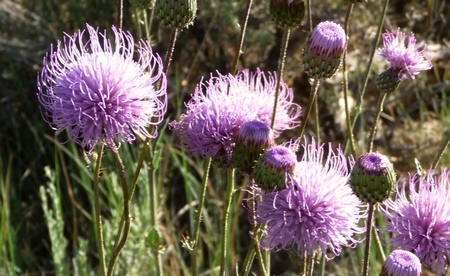 The one below was found at a lower elevation, perhaps 6000 feet above sea level. A lovely, well-defined flower perhaps two inches across. We found this at lower elevations. I think this is a thistle, but I'm not sure. It seemed to be “purple” day. Here’s another, also found at a lower elevation. This one is at a relatively lower elevation. Higher up we encountered another purple set. I can’t quite tell if these are the same flower as above—I don’t think so. At higher elevations these grew in larger clumps, often found with grass. The following is a sego lily. It’s an odd little thing. A stem grows from the ground with this flower being its sole occupant except for a long, thin leaf that’s not much bigger than the stem. I wish I had a better camera for these brilliant white sego lilies! I picked this one because it shows the inner workings best. It’s wildflower season in Colorado. More to come! 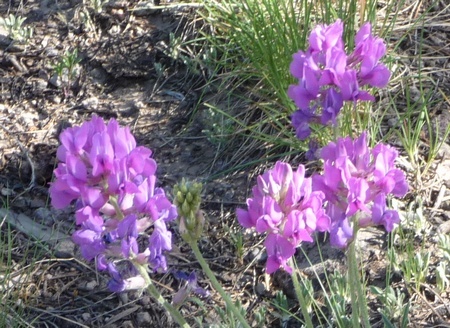 This entry was posted in Montrose County, Wildflowers. Bookmark the permalink. 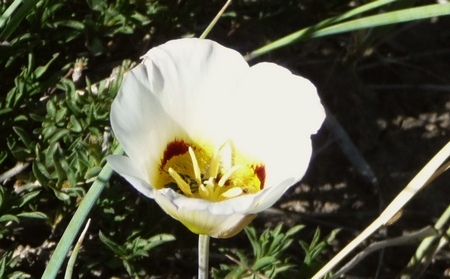 I thought your camera did well with the Sego lily, it’s quite clear.